Nineteen species of Oxalis are recorded in Britain. 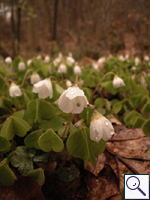 These include only one native species, Wood-sorrel (O. acetosella). The BSBI provide a downloadable plant crib for Oxalis. Two British miners are recorded on Oxalis. The polyphagous agromyzid Liriomyza huidobrensis has been recorded in quarantine in Britain. See also Liriomyza species in Glasshouses and/or Quarantine Interceptions. A key to the European miners recorded on Oxalis is provided in Bladmineerders van Europa. On Oxalis in Britain and elsewhere. Widespread in continental Europe. Pegomya seitenstettensis (Strobl, 1880) [Diptera: Anthomyiidae]. Polyphagous. On 119 plant genera in 31 plant families of which only 4 plant genera in 2 plant families, but not yet on Oxalis, in Britain. Local, probably introduced to Britain. Widespread in continental Europe particularly in Botanical Gardens and glasshouses. Also recorded in Egypt.